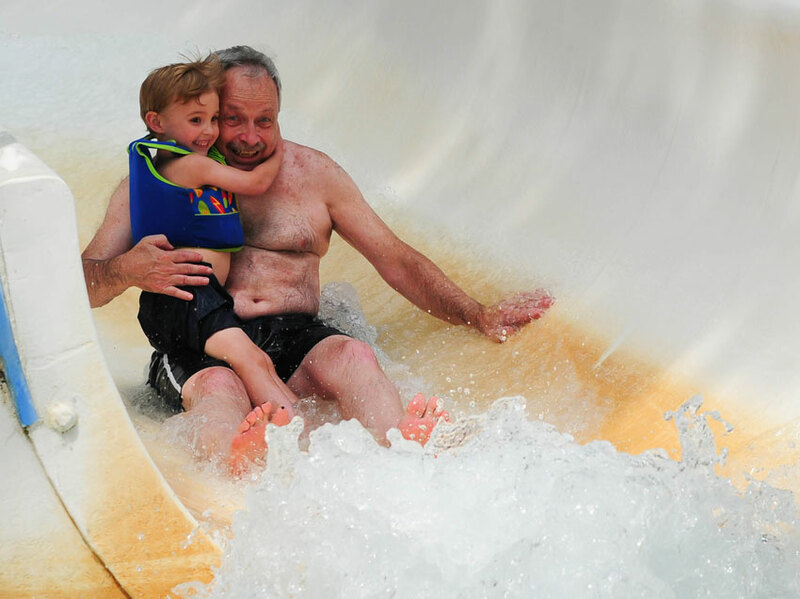 Jimmy L. Gebert, 80, passed away September 24, 2014, in Winona Lake, Ind. He was the father of Rev. Ed Gebert, pastor of Mount Victory UB church (Decatur, Ind.). The funeral will be held at 11 am Saturday, September 27, with visitation one hour beforehand. Location: McHatton-Sadler Funeral Chapel in Pierceton, Ind. L-r: Ron Crawford, Christopher Little, and Matthew Bryant. Three persons attended the latest UB history course earlier this week, September 22-23. 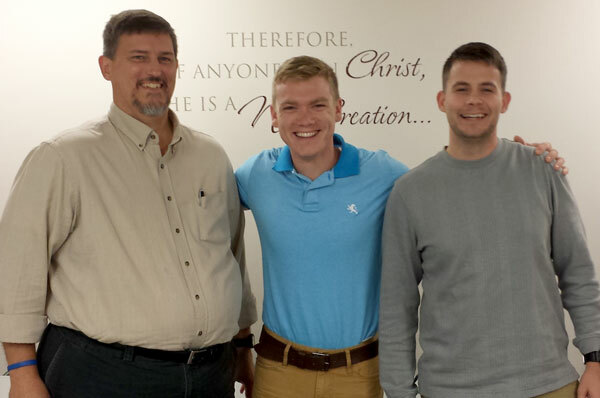 The course was held at Mount Pleasant UB church in Chambersburg, Pa., and was taught by Daryl Elliott (right), senior pastor of Fountain UB church in Keyser, W. Va.
Ron Crawford, Discipleship Director at Blue Rock UB church (Waynesboro, Pa.). Christopher Little, from Mount Pleasant UB church (Chambersburg, Pa.). 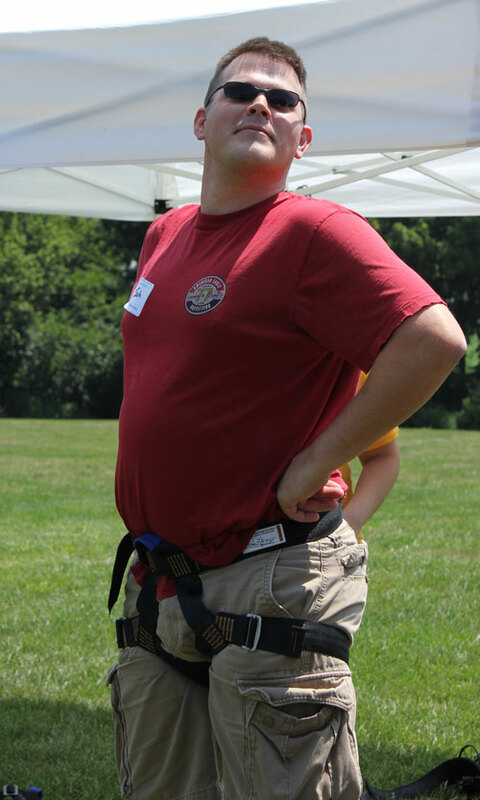 Matthew Bryant, Coordinator of College Age Ministries at King Street UB church (Chambersburg, Pa.). Pastor Jim Bolich (left) conducts one of the day’s five baptisms. Meal time during the Prince Street Family Day at Rhodes Grove Camp. Each year, on the third Sunday of August, Prince Street Church steps away from the hectic pace of our ordinary lives to get away for a day of worship, fellowship, and fun. It’s a way to celebrate old friendships and make a few new ones. This year, more than 160 people gathered outside Chambersburg on the grounds of Rhodes Grove Camp for Family Day. 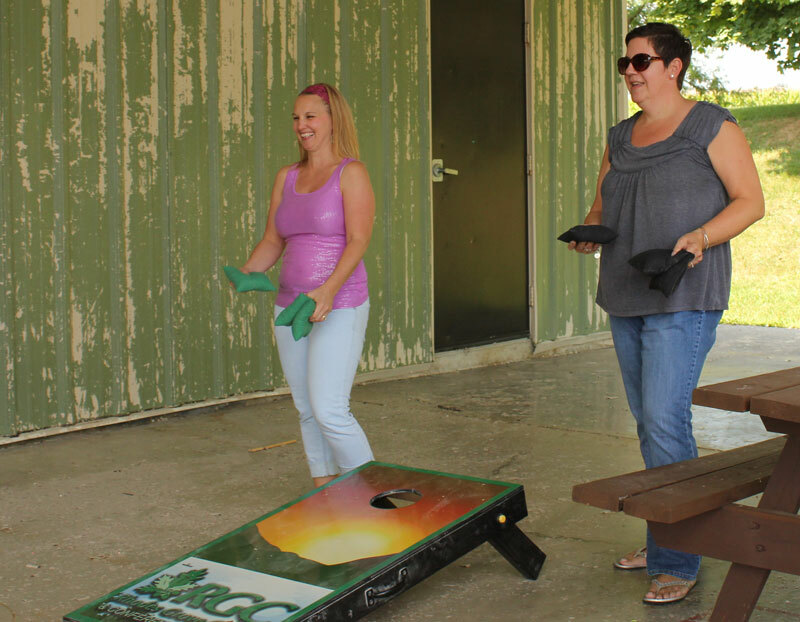 The first 30 minutes of the day were devoted to mingling, giving people who typically attend different worship services opportunity to get acquainted. 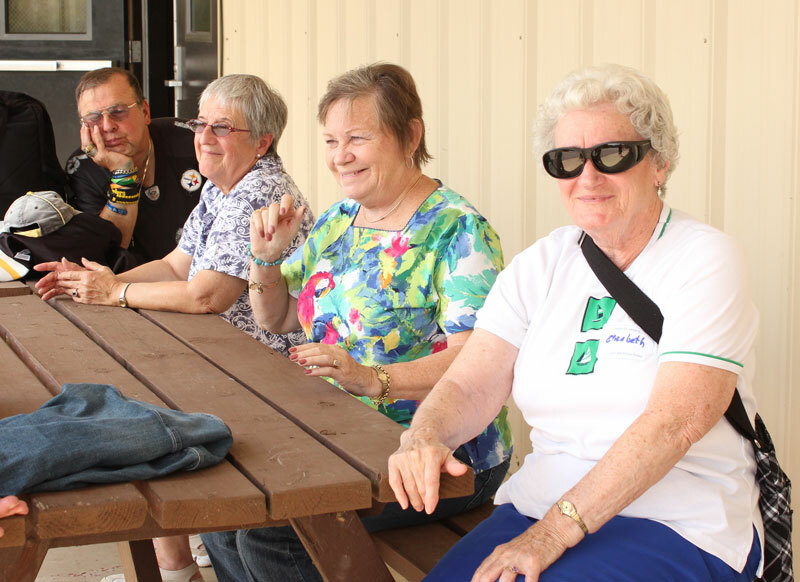 It also provided time to get to know some new friends who joined us for the day. With the room buzzing with conversation, our worship continued with a time of singing, prayer, and God’s Word. As the service drew to a close, we shared communion together. As always, Sunday dinner was delicious. From the fried chicken to the mac and cheese to the ham and green beans, there was something for every taste. But even sweeter than the cupcakes for dessert were the conversations I heard around the tables as we ate together. The skies cleared just in time for us to enjoy the afternoon playing together. Some took advantage of the swings under the shade trees. 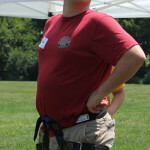 Others climbed the zip-line for an adrenaline-pumping ride. 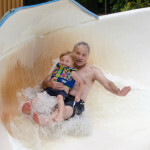 Some waded in the pool, while others found ways to slip beyond the normal boundaries of the water slide. 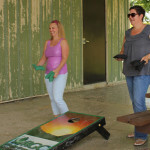 Some enjoyed a game of corn hole, while others simply enjoyed a conversation in lawn chairs. But for me, the highlight of the day was yet to come. 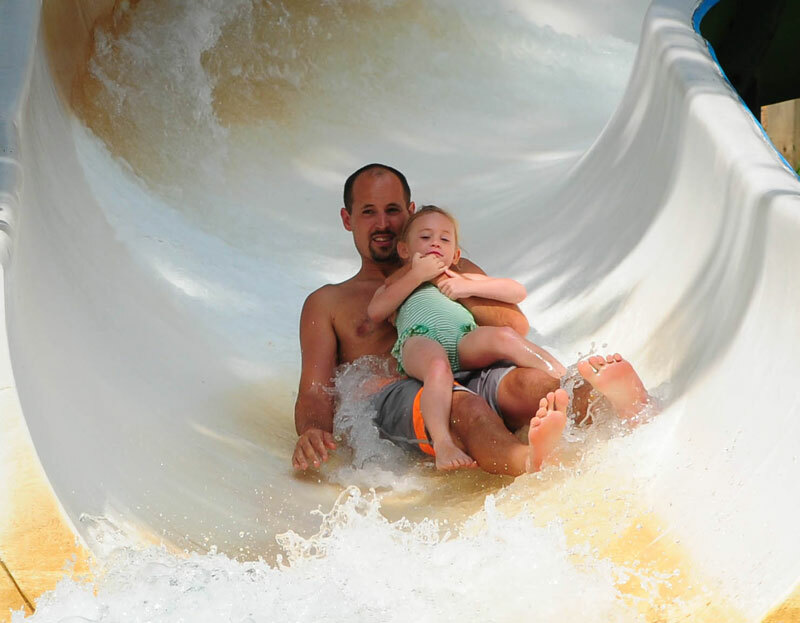 Each year, we offer baptism as the final activity of Family Day. 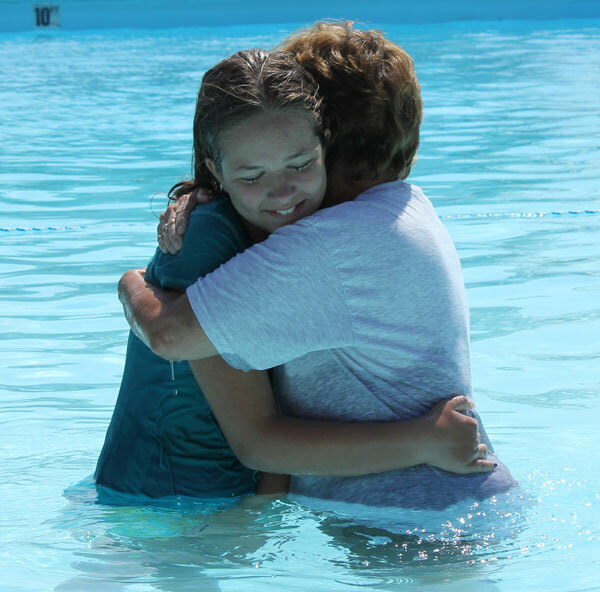 This year, five people gave testimony to their faith through the baptism as their family and friends gathered around the pool. What a celebration! Bishop John Pessima (left) with men who attended a workshop. Workshops were conducted in two places on September 15 and 16. 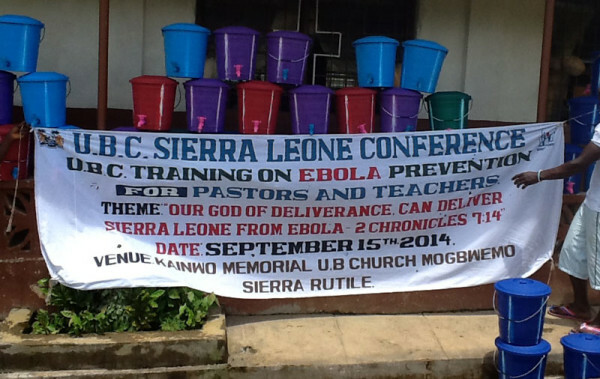 It all started in May this year when Ebola entered Sierra Leone through Guinea and Liberia. We appealed to Global Ministries for help, so we could do sensitization and prevention training in the Sierra Rutile and Mattru communities, where the majority of the United Brethren schools and churches are located. We targeted our pastors, teachers, and medical practitioners—persons who have large constituencies. We knew that if they stood before their congregations or students and talked about the disease, the information would get around quickly. We thank God that Global Ministries responded immediately to our cry. 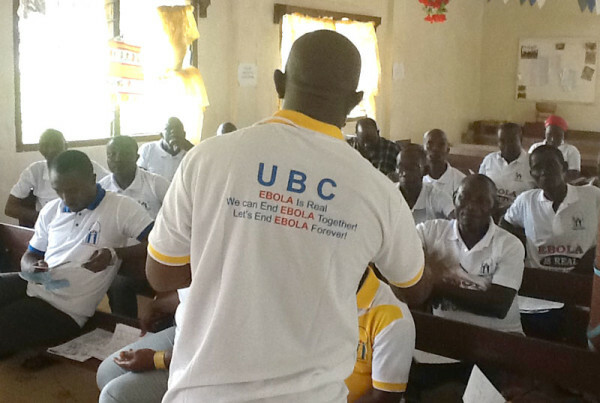 We put together a team of professionals who conducted a workshop on sensitization and prevention of Ebola. This occurred September 15 in Sierra Rutile, and September 16 in Mattru. Altogether, we trained 165 people, who were then instructed to train others in their own communities. 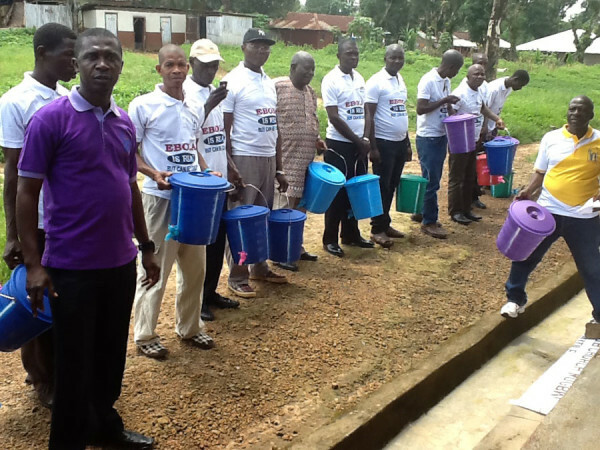 After the two days of training of trainers, participants were provided with a T-shirt, materials on the causes and prevention of Ebola, and a bucket containing medicated soap for their schools and churches (it is now a routine to wash hands with either soap or chlorine before entering homes and public places, including churches). The programs were successful. Participants returned home fully aware of what to do to prevent this virus. Bonthe district is the location of Mattru Hospital, a nursing school with over 450 students, two high schools, and many primary schools. This district is not too affected for now. As a precautionary measure, the tuberculosis ward at Mattru Hospital has been prepared in the event that it is needed to treat Ebola patients. On September 18, there were 29 current cases of Ebola in the district. However, this only reflects confirmed cases. Many more may exist but have been kept hidden. The total number of deaths for the whole country is 483, an alarming number that rises each day. We have a moral responsibility as a church to continue with the intervention and to help our people with food and other relief items. Businesses have closed temporarily, churches have suspended services, and schools have suspended classes. Imports and exports have been halted. The crisis is far from over. Kenema is still quarantined. They need food and other related items which they cannot easily get. 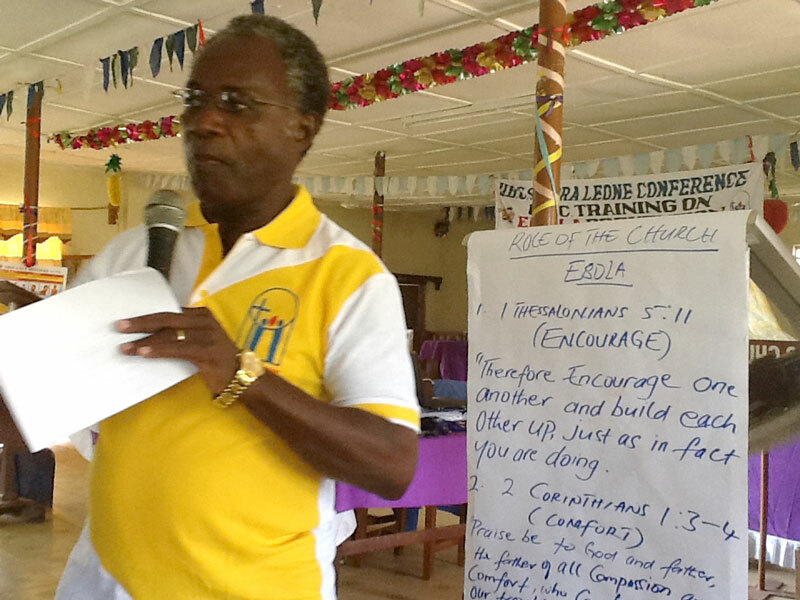 We want to conduct similar sensitization and prevention programs for the members of our various churches in Bo and Freetown, the country’s two largest cities. The virus is spreading quickly because of the influx of people from Port Loko in the north. We are still continuing with our appeal and prayer request for these two conference districts. We also keep getting requests from our brethren in Liberia. Please don’t forget to keep them in your prayers, as this is a new congregation that is also suffering from Ebola. As a church, we believe in reaching out to people in need just as our Lord Christ Jesus went out preaching the Good News, giving hope to the hopeless while also healing the sick and feeding the hungry. Sierra Leone’s economy is down, but we still have hope in the Lord that He will bring this to an end very soon. Some of the attendees at breakfast on Saturday morning, Sept 20. The group Attaboy is leading worship during the women’s conference. Attendees take selfies on Saturday morning. 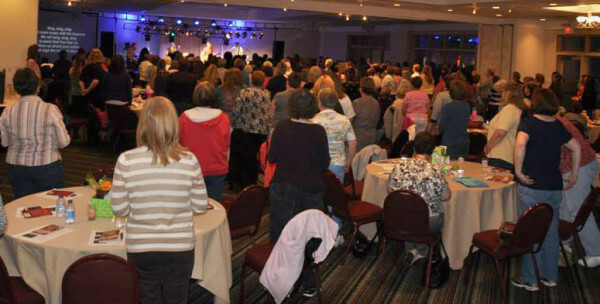 The 2014 UB Women’s Conference began Friday, September 19, at Sawmill Creek Resort in Huron, Ohio. About 240 women are attending–the largest group yet for the women’s conference, which is held every two years. The conference concludes Sunday morning. 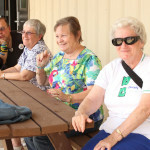 The attendees include Sandy Whipple (wife of Bishop Phil Whipple), Huntington University president Sherilyn Emberton, Global Ministries associate director Donna Hollopeter, and Charlene Bleijerveld, wife of Global Ministries director Jeff Bleijerveld. Nearly 100 photos have been posted on the United Brethren Facebook page. 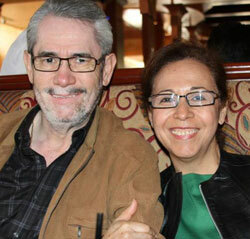 Denis Casco, Bishop of Mexico Conference, provided this “Day 11” update on his wife, Reina, who suffered a brain aneurysm. She is hospitalized in the Los Angeles area, where they live. “Reina is out of ICU to start recovery for a few days more in the hospital. She started walking, small steps, with the help of the physical therapist. Reina is a very strong woman and very soon she will be back to her normal life and her pastoral work, which she has always done with dedication and devotion to God. Reina is pastor of a church in Glendale, Calif.
Pastor Lester Smith as the Apostle Paul. 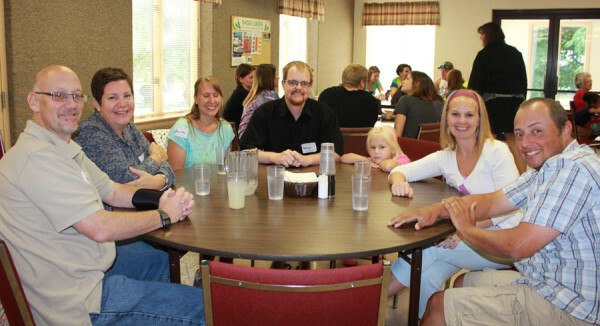 Hillsdale UB church (Hillsdale, Mich.) held its 16th annual Friends and Family Day on Sunday, August 24. 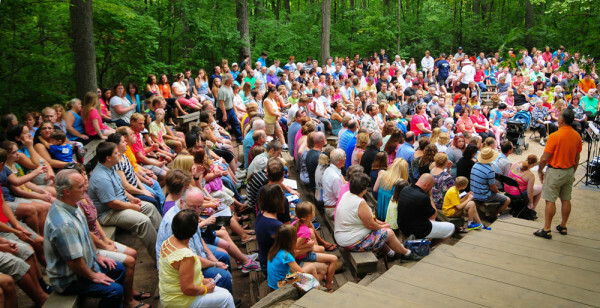 The event began with an indoor service at the church, followed by an outdoor service at the Fireside Memorial Chapel at Michindoh Conference Center. 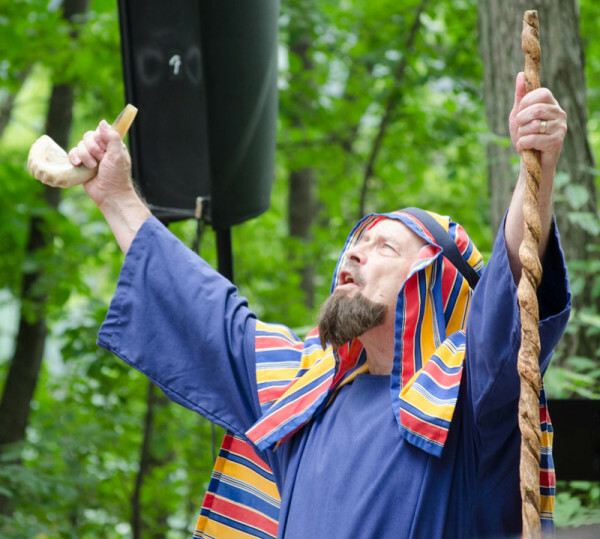 Pastor Lester Smith, playing the role of the Apostle Paul, delivered the book of 1 Thessalonians in both services. There were a large number of visitors, with a combined record attendance for this event of over 550. 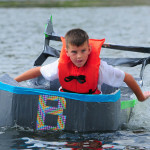 After a potluck lunch, everyone enjoyed the camp water slide, swimming, and a cardboard-with-duct-tape boat race. 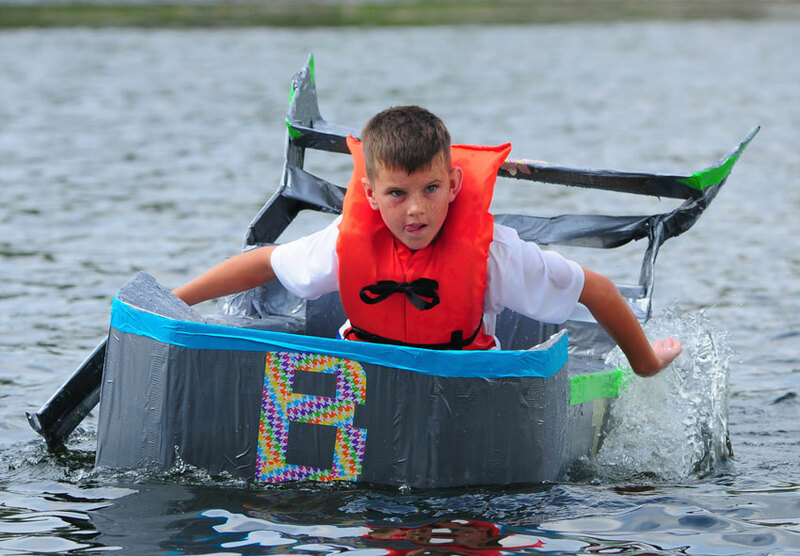 An entry in the cardboard-and-duct-tape boat race. 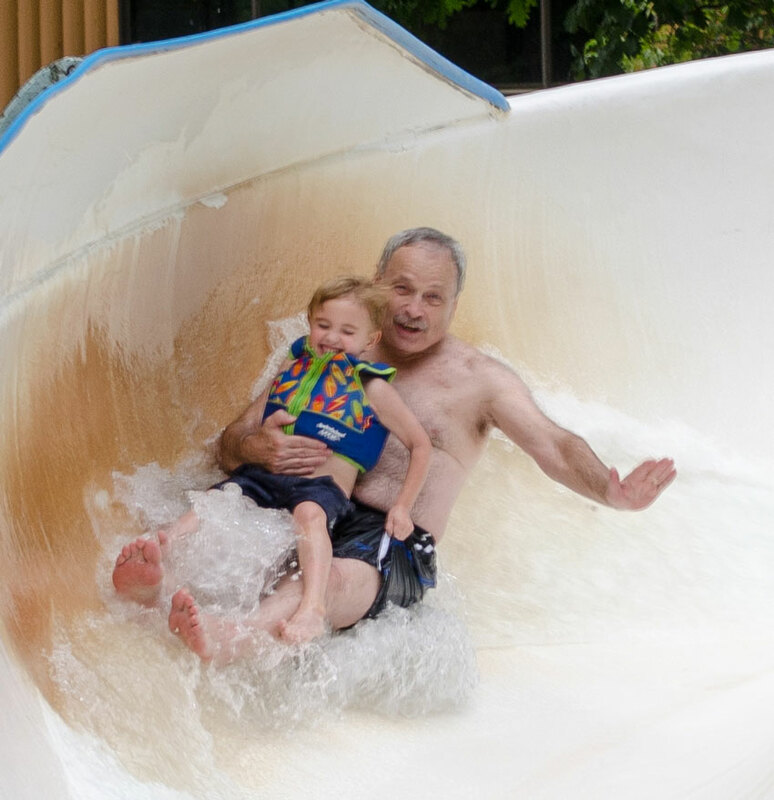 Pastor Lester Smith going down the water slide with his four-year-old grandson, Titus Eisenmann.